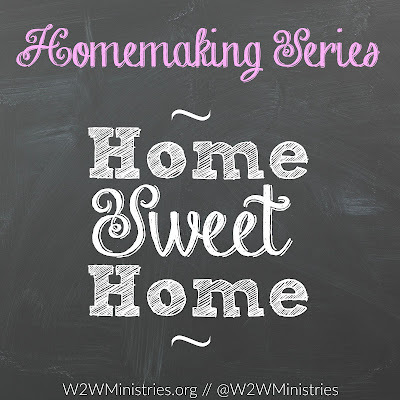 So far in our homemaking series, we've discussed homemaking with your heart, your husband and your kids. Today, we will discuss homemaking with our time. 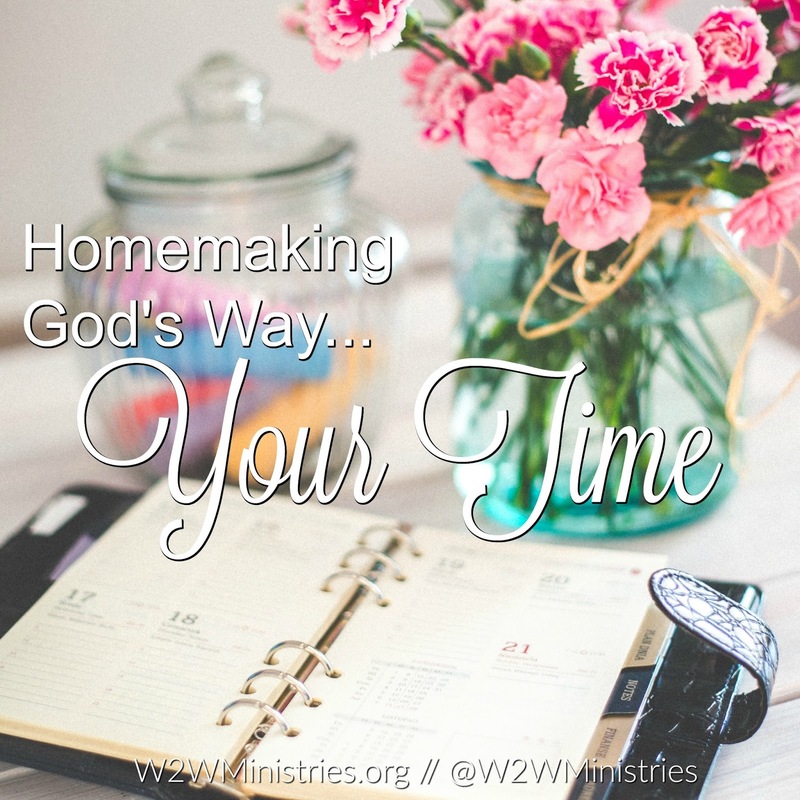 Growing up, our girls ministry at church had a motto: Be faithful stewards of your time, money and talents. We often hear of people talking about being faithful in their money by giving in tithes and offering. We even hear people talking about being faithful in their talents by using them for the glory of God. But what about our time? 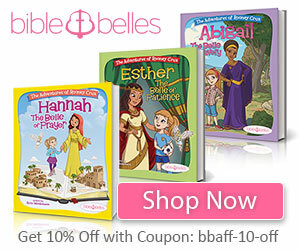 How can we be faithful in our time? Staying at home, it would be so easy to flip on the tv and sit on the couch and spend the majority of my day there. It would even be so easy to play on the laptop or iPad all day, I can always cruise through social media work. But those are not good uses of my time. In fact, too often, they are time wasters. There have been days where I have been working on the laptop (not doing school with the kids, but ministry work with occasionally scrolling social media) and before I know it, hours have passed by. I look up and very little, if anything, was accomplished in my home. Pray. Ask God to help you honor Him with your time. Wake up before the kids. I know it's not always easy. Especially after a long night of waking with the baby or a sick little one. But I promise you, it is so worth it! 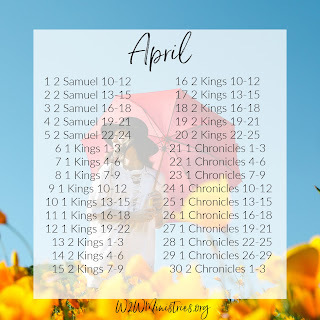 You are able to get uninterrupted time with God, shower and get ready, and you might even have time to start some laundry or load the dishwasher. When I wake before the kids, I feel 100 times more productive. Keep the tv off. If there is a show you want to watch, record it and go back and watch it when all of your work is done or maybe while the kids nap. The tv is a huge distraction. If you have it on just for background noise, try Christian radio instead. Multi task! While you watch that tv show, fold laundry or iron a pile of clothes. Limit yourself when it comes to your phone, iPad or computer. If you are not using it for work (real work/ministry, not "work") then set limits. You can set a timer for 15 minutes or so, when it goes off, put the device down. Social media is not going to crash because you haven't checked it for 10 minutes, I promise you. Use a planner and have a routine. 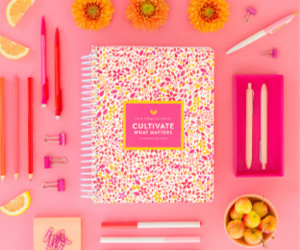 Use a planner to help you remember all of the things you need to do for the day, week and month. Make sure your husband and older children know what is going on so that everyone is informed. Have a regular daily routine and post it someone in your home so that everyone can see. Recognize your time wasters. What uses up most of your time that is not related to the family or home? Think of how you spend your day, every last minute and every last detail. Is there something you are spending too much time on that you should scale back? 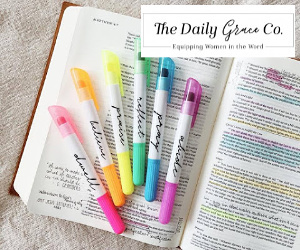 When we are good stewards of our time, not only do we honor God and our family, but we accomplish more in the daytime hours allowing for us to spend more quality time as a family in the evening hours. I don't know about you, but I would much rather work hard during the day and have the evening open for laughter and relaxation with the family, than goof off on social media or watching tv during the day, and have to work in the evening. I pretty much live by my planners. First, I use the Cozi app for my family. I love Cozi! This is an app that we all 6 have on our phones and I have on my iPad. You can also access Cozi on a computer. You sign in and create your family's account. Each family member can log in on their cell phone using their email address and password. They can even customize the look of their app. Each person has a color so that everything is color coded and there is a family color. When you open the app, each person can see everything going on. My husband loves the email feature. Every Sunday everyone in our family gets an email letting them know what is going on in the family that week. He loves seeing what is coming up in the days to come. You can get as many as 3 reminders for each event, which is great for this very forgetful woman. 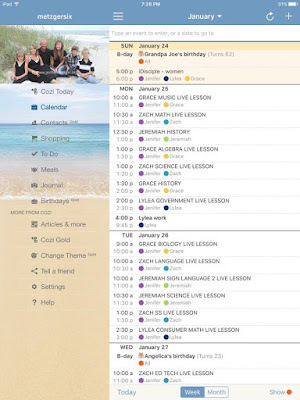 And another great Cozi feature is you can share a schedule with someone outside of the family. 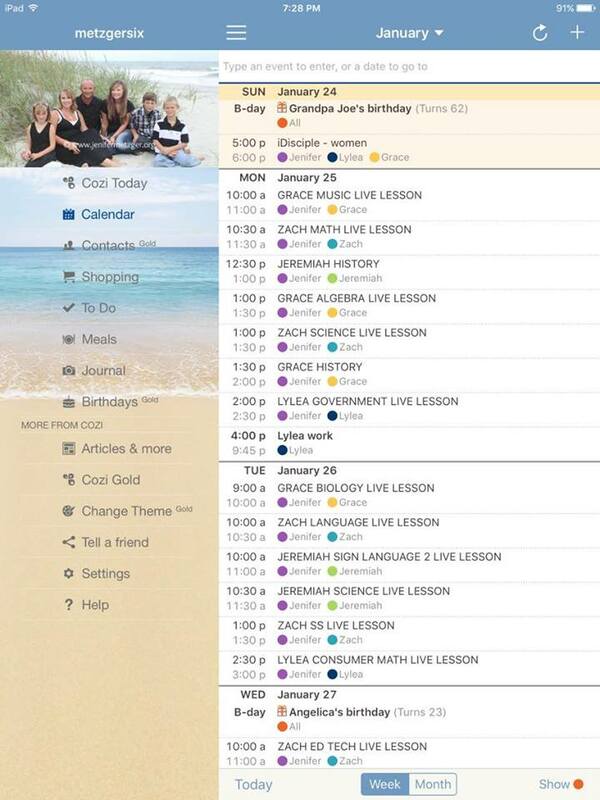 For example, when the kids have sports, I could schedule their games, then share the game schedule with grandparents. Here's a Cozi screen shot to give you an idea of how the app works. 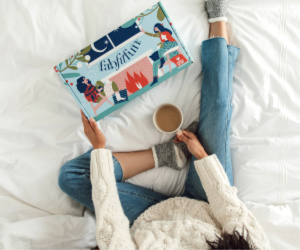 Even though I use and love Cozi, I am a paperback girl all the way! I love my paper planner and use it daily. 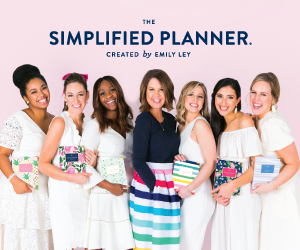 My favorite planner is the Homemaker's Planner from Homemaker's Depot. This planner sits on my kitchen counter for everyone to see. In addition to a monthly calendar, there is a greatly weekly calendar that I add our dinner menu too. The kids use to ask me all day long what we were having for dinner, now they just look at the planner. There is also a place for notes, a perforated shopping list and more. 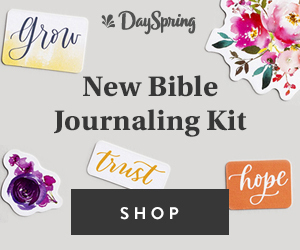 These are great tools for keeping me organized and helping me be a good steward of my time. 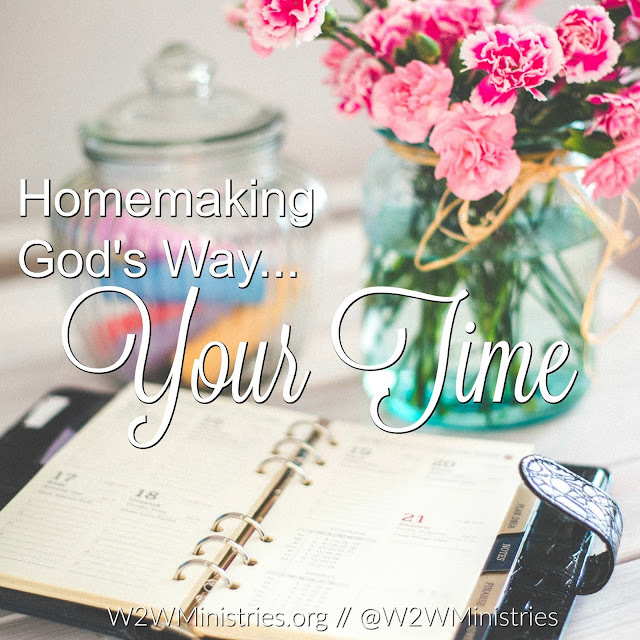 Remember, being a good steward of your time is an important part of homemaking. Go through the above bullet points and decide what you need to work on. Be intentional about your time. Shut the tv off, make a routine, do whatever you can to be a good steward of your time. Thank you so much Jenifer. You are a blessing!